PM Netanyahu promises to send Israeli tourists to Colombia, stresses importance of countries' cooperation in fighting Iran, ISIS. 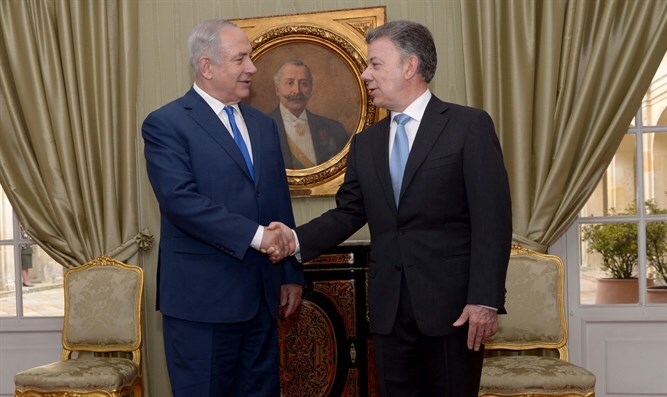 Israeli Prime Minister Binyamin Netanyahu yesterday (Wednesday) met Colombian President Juan Manuel Santos at the Presidential Palace in Bogota. Speaking to Santos, Netanyahu said, "Under your leadership in recent years it's been a remarkable alliance [between Israel and Colombia] of faith and values; faith in the future. "I have to tell you, this is my second visit to Colombia. I came here for one evening some 30 years ago. I think I was ambassador to the UN, and I was invited to Bogota for one evening... One thing I want to tell you is that I don't think that official visits of the Prime Minister of Israel and acting Prime Minister of Israel should be 70 years apart, so I guarantee you the next visit will be a lot closer at hand. "I think that this, the fact that this is the first visit of a sitting Israeli prime minister to Latin America and Colombia, is one which infuses us with great excitement and emotion. We believe there is great hope, and that Latin America, as a whole, has tremendous potential." Similar to what he told Mexico's leaders, Netanyahu said, "The world is now at the juncture of a great change. The world economy will never be the same again. Everything is becoming technological, everything. Areas deemed as low-technology are becoming suffused with technology. This changes productivity and the benefits given to people. Some of these were unimaginable just a few years ago. "We discussed cyber security. This is an area that is important for all countries, but not only on the governmental level, even your bank accounts. People save and they deposit money in banks, and somebody can come and steal your money, and so you need protection. "We agreed that we’d have some people who you will designate sent over to Israel. I think they’ll benefit from this experience and we'll cooperate with you as well on this. We talked about tourism. I can say after the signing of this tourism agreement, I'm the first Israeli tourist here, but many more will follow... And we will welcome all Colombians who come to see Israel, a country which connects the old with the new, and has some great sites from the history of Christianity, but also great sites of leisure and futuristic technology.... We see all this as very fertile field which we can work on together to benefit our peoples." Netanyahu also spoke about the growing threat of terrorism, specifically from Iran and ISIS. "Just as the world is giving us untold possibilities, there is also a great threat which has emerged.," he explained. "This is not merely the threat of terrorism, which Colombia has gone through and has overcome. It's the threat of militant Islamic terrorism, which plagued first Muslims and then the rest of the world. "This terrorism has two heads: one is ISIS, and the other is Iran. There is a newfound relationship between Israel and the Arab countries, because they now see Israel not as an adversary, but as their indispensable ally against these forces which want to draw back humanity from its fantastic future to a barbaric past. Iran is sending its forces and its terrorist branches everywhere, including into Latin America. "We believe that all countries should unite, as Israel is cooperating with Arab countries, to prevent the expansion of Iranian aggression and terror to other continents as well." Concluding his speech, Netanyahu spoke of friendship and cooperation, and announced a new joint innovation fund. "We have cooperated in the past on security; we stand ready to cooperate in the future," he said. "I think that if we provide security for our people and we provide the benefits of technology and innovation to our economies, this will give I would say a future of hope and purpose for both Colombia and Israel. "The future belongs to those who innovate. Israel is an innovation nation. Colombia has outstanding capabilities and people. We’d like to merge them together, so we have decided today on rekindling and refinancing an innovation fund: the Colombia-Israel Innovation Fund. Maybe you will teach us finally how to make a good cup of coffee, but many, many other things I'm sure. "I want to thank you once again for your hospitality, and I look forward to our continued cooperation."